April of 1974 was highlighted by new Mid-Atlantic Tag Team Champions being crowned, the return of two major stars to Jim Crockett Promotions and the departure of two others. In addition, two heated feuds continued to stay red hot during the month of April. Mid-Atlantic Heavyweight Champion Johnny Valentine had limited Title defenses during the month of April, as he had his hands more than full dealing with the sensational Bearcat Wright. Valentine and Wright battled all over the Mid-Atlantic area during April, with their bouts being as rough and wild as one could imagine. The two wrestled against each other in several towns more than once during the month of April. In Charlotte, North Carolina, Bearcat and Valentine actually wrestled THREE times in April! On April 1st, the two got so out of control that both combatants were disqualified…and the fans at the Park Center were nearly as out of control as the wrestlers! The next Monday night, Wright and Valentine came back to the Park Center for a “Return Match.” In the return bout, Valentine was able to keep his emotions in check far better than Bearcat, and emerged with a victory via disqualification after a mere 13 minutes of non-stop action. The final of the three non-title bout series at Charlotte’s Park Center between Wright and Valentine was held on April 29th. And to try and keep order, the mammoth Haystacks Calhoun was brought in as a Special Referee! Calhoun was able to keep order better in the April 29th match, but the action between these two bitter rivals was still off the charts! The Township Auditorium in Columbia, South Carolina was also fortunate to play host to multiple bouts between Johnny Valentine and Bearcat Wright during April of 1974. The first match was a Championship Match held on April 16th, before a capacity crowd. This bout got so out of control that it took six wrestlers to finally break up the mayhem! The return bout on April 23rd was not much tamer. As Bearcat and Johnny were battling outside the squared circle, Valentine was barely able to beat Wright back into the ring just before the 10 count to capture a highly controversial victory. 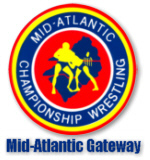 Two major stars made their return to Mid-Atlantic Championship Wrestling during the month of April. Rip “The Profile” Hawk returned to the territory for the first time in 1974. His first match was on April 8th in Charlotte, where he teamed with Ivan Koloff in a disqualification loss to Nelson Royal and Sandy Scott. Hawk remained active during the month, both in singles and tag team competition. Hawk and Koloff certainly emerged as a fearsome team during the month. Another BIG addition to the roster, literally, in April was the massive 601 pound Haystacks Calhoun! Haystacks’ return to Jim Crockett Promotions made his multitude of fans joyous, but did not make his opponents happy at all. Calhoun’s first match back in the area was a thorough thrashing of “Bruiser” Bill White at the Lynchburg City Armory in Lynchburg, Virginia on April 5th. Haystacks did a little bit of everything during the month, including being a Special Referee as was mentioned earlier. Calhoun was a coveted tag partner, and some of the most exciting bouts of the month of April saw Haystacks participating in wild six man tag team bouts. One of the most entertaining occurred in Norfolk, Virginia at the Scope Exhibition Hall on April 18, 1974. In that contest, Calhoun teamed with Danny Miller and Nelson Royal to upend the villainous trio of Rip Hawk, Ivan Koloff and Chuck O’Connor. NWA World Heavyweight Champion Jack Brisco made an extended pass through the area during the month of April. Brisco took on all the top contenders in the territory, putting his prestigious Title on the line, against good guys and bad guys alike. Jack defeated Johnny Weaver in Championship Matches on two occasions, at the Cumberland County Memorial Arena in Fayetteville, North Carolina on April 1st and in the Richmond Arena in Richmond, Virginia on April 5th. Brisco also took the measure of Paul Jones in a very competitive Championship Match in Columbia, South Carolina on April 2nd. While this bout in Columbia stayed scientific for the most part, there were occasions where both Brisco and Jones resorted to slightly questionable tactics. One of the most riveting matches of the month occurred when Jack Brisco put his NWA World Heavyweight Title up against the mask of the Destroyer. Actually, it would be more accurate to say that Brisco defended against the SUPER Destroyer, as the masked man started going by that moniker in April of 1974. This epic bout took place on April 4th at the Greensboro Coliseum in Greensboro, North Carolina. Many in attendance thought that surely there would be a Title change, or in the alternative, that the Super Destroyer would lose his hood. While neither of those scenarios occurred, the bout nevertheless lived up to its billing. After tremendous ebbs and flows, and one sequence where it appeared the Super Destroyer’s claw was going to carry him to victory, Brisco slowly seized command. At the 28 minute mark, Jack chased the masked man out of the ring and the Super Destroyer chose not to return! A bizarre ending to a tremendous match! The Super Destroyer continued to have his hands full in the month of April with big Swede Hanson. The two battled in a wide variety of specialty matches during the month, with Hanson coming out on top more often than not. One of the most brutal series of matches during the month were Chain Matches between these two heated adversaries. The Super Destroyer and Swede Hanson battled in Chain Matches in Richmond, Virginia on April 5th, Charleston, South Carolina on April 12th and Greenville, South Carolina on April 29th. The Big Swede came out on top in all three Chain Matches, but lost copious amounts of blood in these vicious encounters. Swede and the Super D. also locked up in two Lumberjack Matches during April. Hanson took the measure of the masked man on April 1st in Greenville, and repeated the feat in Roanoke, Virginia on April 13th. Both these bouts saw the Lumberjacks become highly involved! These two even wrestled in two very physical Strap Matches during the month! Talk about rough! The Super Destroyer was victorious in a bloody Strap Match held in Raleigh’s Dorton Arena on April 23rd. Swede got his revenge a few days later, besting the Destroyer in Greenville, South Carolina on April 29th. The Mid-Atlantic Tag Team Titles changed hands during the month of April, in what would have to be classified as a major upset. On April 8th in the Cumberland County Memorial Arena in Fayetteville, North Carolina, the team of Paul Jones and Bob Bruggers unseated Gene and Ole Anderson in a No Disqualification Match. After this defeat, the Anderson’s did not stay in the territory much longer. The Minnesota Wrecking Crew’s last match in the Mid-Atlantic area during 1974 was a defeat at the hands of Bob Bruggers and Johnny Weaver on April 20th in the Spartanburg Memorial Auditorium. Jones and Bruggers only had one rematch with the Andersons after defeating them for the Mid-Atlantic Tag Team Titles. That bout occurred at the Richmond Arena on April 12th, with Jones and Bruggers prevailing. The new Champions also wrestled twice in Raleigh, North Carolina after their Title win, defeating Rip Hawk and Ivan Koloff by disqualification on April 16th, and were victorious over Gene Anderson and Chuck O’Connor on April 23rd. Mid-Atlantic Television Champion Danny Miller was more active during the month in tag team competition, but he did manage some singles matches in April. The most noteworthy was a violent confrontation with Gene Anderson in Charleston, South Carolina on April 5th. Gene seemed to go out of his way to injure Danny during this match, but Miller was able to eventually turn the tables and subdue Gene with his famous “chicken-wing” hold! The month of April 1974 saw a significant shift in the roster of Jim Crockett Promotions on the main event side of the talent ledger. And the changes weren’t done! May loomed on the horizon, with the biggest name in the history of Mid-Atlantic Championship Wrestling set to enter the territory for the first time! 1. Haystacks Calhoun---The HUGE man from Arkansas came back to the Mid-Atlantic area, and was just as big and popular as ever! Haystacks was particularly dominating when he got involved in tag team and six man tag team matches. 2. Paul Jones---Mr. Number One had a big month in singles completion, including a classic bout for the NWA World Heavyweight Championship against Jack Brisco. Jones also became one-half of the Mid-Atlantic Tag Team Champions during April. 3. Swede Hanson---The Big Swede had a mostly successful series of bouts with the Super Destroyer during the month of April. In this long running feud, Swede seemed to gain the upper hand during April. 1. Ole Anderson---After dropping the Mid-Atlantic Tag Team Titles early during the month, Ole struggled in both tag team and single bouts. By the end of April, Ole was no where to be seen, and would not be seen in Jim Crockett Promotions again until 1975. 2. Gene Anderson---During the month of April 1974, Gene suffered a similar fate as brother Ole. 3. Super Destroyer---While the Destroyer was starting to be called the “Super Destroyer” during the month of April, he didn’t have one of his stronger months. Big Swede Hanson was becoming a huge thorn in the side of the Super D.